Just a week and a half ago at D23 Expo 2017, Walt Disney Parks and Resorts chairman Bob Chapek revealed that two of Walt Disney World‘s long-running attractions– namely The Great Movie Ride at Disney’s Hollywood Studios and Universe of Energy (currently known as Ellen’s Energy Adventure) at Epcot— will be shuttered permanently in mid-August to make way for new rides starring Mickey Mouse and Marvel’s Guardians of the Galaxy. As sad as that news was to some Disney theme park fans, what was even more troubling was the fact that many of them wouldn’t even get the chance to ride these beloved attractions one last time before they closed down forever due to their Annual Pass blockout dates, which often prevent regulars from attending the parks throughout most of the busy summer season. Fortunately, Disney considered guest protests and sent out an email today announcing a revised blockout date schedule. 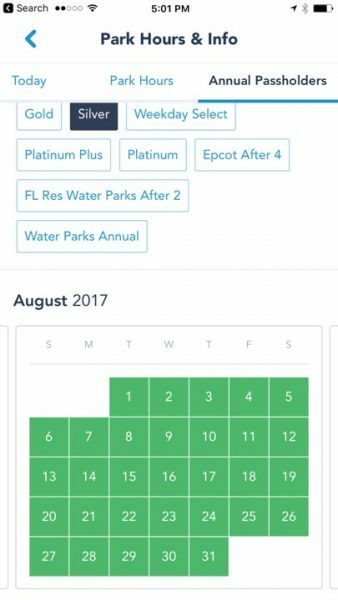 Now guests who have a Silver-level or Weekday Select Annual Pass can attend Walt Disney World parks beginning Tuesday, August 1st instead of Monday, August 14th, as was previously the case. 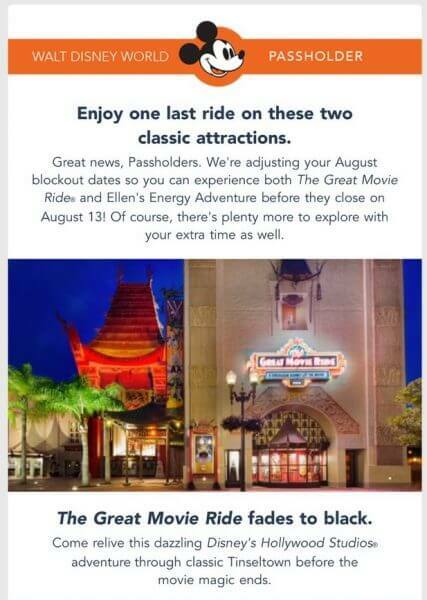 So breath easy, pack your ears, and get ready to get as many rides in as possible on The Great Movie Ride and Ellen’s Energy Adventure starting next Tuesday, and running through the day both attractions close down on Sunday, August 13th.